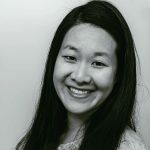 Published Mar 11, 2018 By Julia 17 CommentsThis post may contain affiliate links. Calling all chocolate lovers! This recipe shows you how to make your own low carb milk chocolate, perfect for the keto diet. 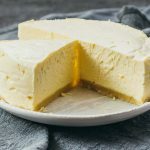 Low carb chocolate is a common request from anyone following a keto diet. Some people wonder if it’s possible to have no carb chocolate; unfortunately, the answer is no because even unsweetened 100% cocoa has carbs. And given how bitter unsweetened chocolate is, you need to add some kind of sweetener. To keep it low in carbs, that usually means a sugar free sweetener such as a mixture of stevia and erythritol. This recipe is simple: just five ingredients combined together on the stovetop. The result is a ketogenic friendly milk chocolate that’s smooth, creamy, and solid at room temperature. 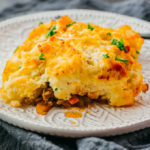 It only has 1g of net carbs per 1 ounce serving. 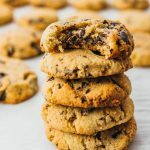 You can use this recipe to make chocolate candy bars, keto peanut butter cups, or low carb chocolate chip cookies. This is actually not my recipe. It’s from Mr. Savory Tooth (or maybe it should be Mr. Sweet Tooth…) and it’s been months in the making. He probably experimented with 5-10 different versions before getting it right. The texture and taste has to be similar to milk chocolate, it needs to stay solid at room temperature, and it also has to look like milk chocolate. We use unsweetened baking chocolate so that we’re starting off with pure 100% chocolate with as few carbs as possible. I like Bakers brand, but any other brand will work as long as the chocolate is unsweetened. The chocolate is melted with cocoa butter and whey protein powder, to give a milky appearance and taste. Lastly, we use a combination of liquid stevia extract and powdered erythritol to sweeten the mixture. Why do we use both? Because if you use too much stevia, the taste will be overpowering, and if you use too much erythritol, you get a crystallization effect. If you’ve never melted chocolate using a double boiler before, watch the video below by Food52. All you need is a pot and a wide heat-proof bowl that can sit atop it. I’ve used both stainless steel and glass bowls. After your chocolate mixture is combined and smooth, it’s time to pour it into a mold tray. You can use any mold you like, such as chocolate bar molds or molds with various fun shapes. 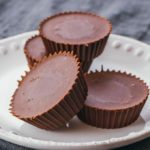 I poured the chocolate mixture into foil cupcake wrappers (pictured here) since I was using them to make keto peanut butter cups. Use unsweetened 100% dark baking chocolate. If you’re not sure of a particular product, check the nutrition label. It should be about 55% fat by weight and the ingredients list should not include sugar. I don’t recommend substituting with unsweetened cocoa powder. If you do, you will likely need to combine cocoa powder with an equal weight of cocoa butter to make baking chocolate. Cocoa butter is best. You can use coconut oil instead, but the end result will not look as milky and will not be solid at room temperature. The erythritol sweetener must be powdered. Granulated erythritol will give a pronounced crystallized texture. You can substitute with another dry powdered sweetener. Note that erythritol is only 70% as sweet as table sugar. If you use Swerve or anything else with a 1:1 substitution ratio for sugar, you’ll need to use less. Get the chocolate, cocoa butter, erythritol, and protein powder measured out by weight before starting the recipe. Double-check your numbers. Make sure you are combining ingredients using heat that’s just hot enough to melt the ingredients. Don’t overheat. Chocolate will taste the smoothest the same day that you make it. For best results, enjoy once it has hardened. Calling all chocolate lovers! 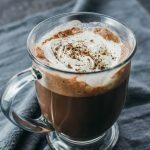 Make your own low carb milk chocolate, perfect for the keto diet. Blend the erythritol and whey protein together into a superfine powder. This will result in smoother chocolate. Prepare a double boiler setup (recommended), or a small saucepan over low heat. Add cocoa butter and heat, stirring occasionally until melted. Add baking chocolate, stirring continuously until smooth. Add erythritol, whey protein, and stevia, stirring continuously until well mixed. Remove from heat and continue to stir until very smooth. 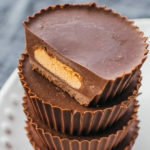 At this point, you can proceed to the Keto Peanut Butter Cups recipe if desired. Or pour into chocolate molds. Refrigerate to cool until hardened. Store and enjoy at room temperature. 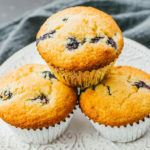 This recipe yields 1 g net carbs per 1 oz serving. Total recipe makes 13 oz of chocolate. Nutrition information does not include erythritol, which cannot be digested by the body. 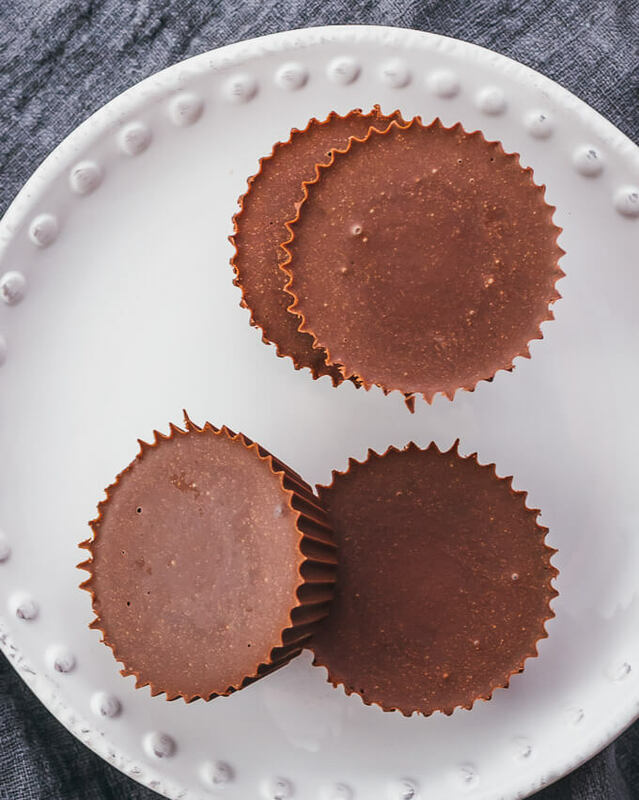 Finally, a keto chocolate and butter cup recipe that works and tastes incredible. 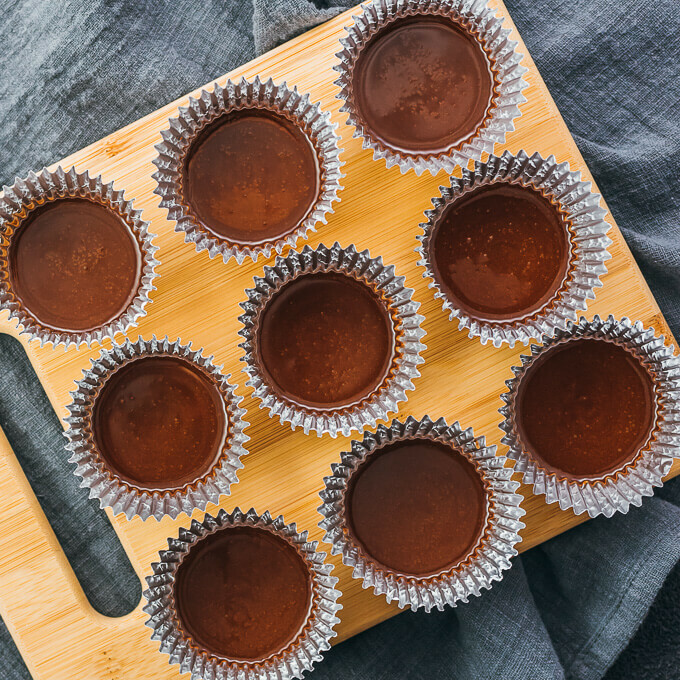 I made mini cups and came out with 24 gorgeous little cups of yum! Thank you, thank you! For us, this was still too close to dark chocolate and bittersweet. Is there a way to tweek this recipe so that it tastes closer to milk chocolate than dark chocolate? 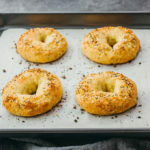 I am using these recipes for my husband who is a diabetic seeking alternatives to high carbs and sugar. Hi Julia! You can try adding more erythritol and/or stevia to sweeten the chocolate. Quick question: in the ingredient list you have cacao butter but in the “tips” section it is down as cocoa butter. Which one do you use in the recipe? Thanks in advance! Hi Monica! It should be cocoa butter — I’ve changed it in the ingredients list. Some brands use the terms interchangeably, so you may find it listed under both names. Is there something I can use in place of the whey protein powder? Will egg white protein powder work? Hi Alice! 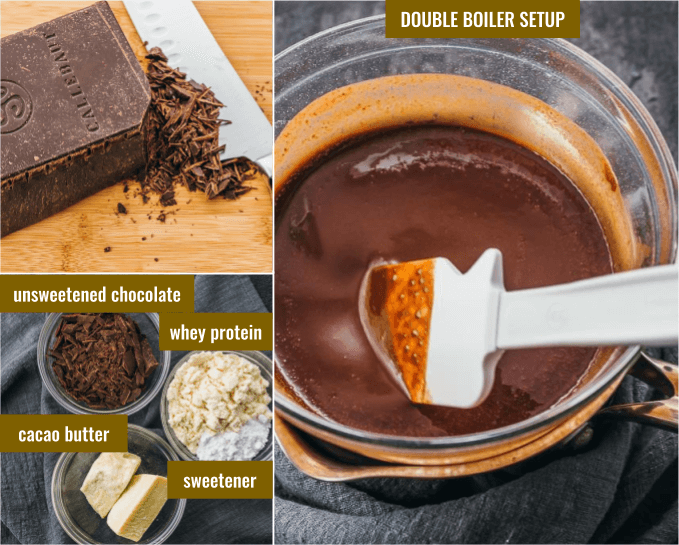 The whey protein powder gives the chocolate a more milky taste and adds protein. If you can’t use it, I would recommend just skipping it. I’m not sure about the egg white protein powder; my guess is that the chocolate would turn out better without the whey powder than trying to substitute with the egg white powder. Are you being sure no water or steam gets in the mix? That can cause the chocolate to seize, also be sure to not over heat it. Unsweetened baking chocolate comes in 4oz bars. Is that a typo in your ingredients list? That’s not a typo. Baking chocolate comes in different weights, depending on the brand. Have you tried Lily’s chocolates? They are low carb. I’ve seen them sold at Whole Foods. I’ve always wanted to learn how to make my own keto chocolate!